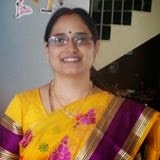 Hi, Good Evening, Thank yo friends and viewers. 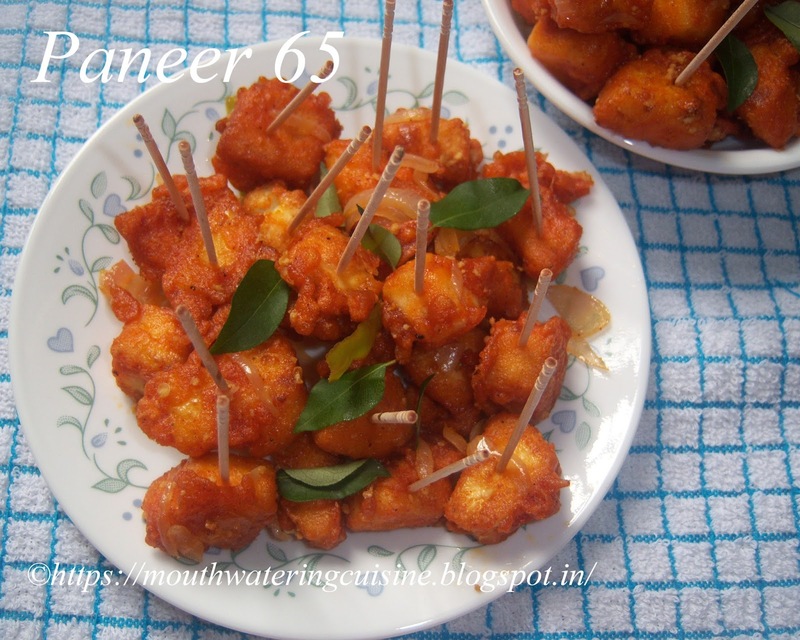 Today I will post how to make Paneer 65 recipe. Paneer 65 is yet another simple kids favourite snack item. One of our neighbouring aunts taught me how to make aloo 65. 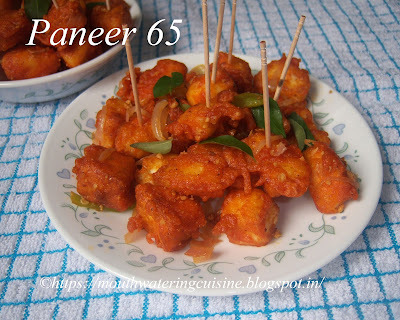 I just followed the same and made paneer 65. It is served in South Indian restaurants. It is served as starter and appetizer. It is delicious and spicy. Paneer coated with spices, deep-fried and sauteed with onions and drizzled with lemon juice. Chicken 65 is the base for all different varieties of 65s like aloo65, gobi 65. Those who don't eat non-vegetarian paneer is the option. Of course, aloo and gobi also take its place. Check out for more recipes with paneer -- paneer tikka, paneer butter masala, palak paneer and shahi paneer. Cut paneer into cubes. Chop onions length wise and slit green chillies. In a wide bowl mix paneer, flours(rice flour and corn flour) and spice powders(salt, red chilli powder, coriander powder, garam masala and chat masala). Add little water and make thick batter out of it. The entire spice powders and flours should coat with paneer cubes. Heat oil in a pan, drop each coated paneer into it. Drop as many paneer pieces as we can fry at once. Do not over crowd. Fry till they become crispy and turns brown colour. Once done take them onto an absorbent paper. Repeat the same with the rest of the paneer. Heat 2 tablespoons oil in another pan, saute onions and green chillies. Saute them till the onions turn translucent. Add curd to it. When curd starts boiling add red chilli powder, chat masala and garam masala to it. Mix it well and add fried paneer to it. Switch off the flame and sprinkle curry leaves and lemon juice. Thank you for the recipe....I will try this.